Okay, okay – I’ve been going a little crazy with the pancakes. When I find a fat substitute that works, I run with it. Also, cleaning out my pantry. Whisk all the dry ingredients together. Add applesauce to dry ingredients. Add the egg white and start pouring water until the mixture makes a thick pancake batter (you’ll need 1/4 water or so). Make the pancakes (you know, skillet, flip…please tell me you know how to make pancakes). Enjoy! Spray with butter substitute of choice and sprinkle with Splenda and cinnamon! Note: You can leave out the cinnamon. The pancakes will be moister. I enjoy topping the pancake with a thin layer of the unsweetened applesauce, spray butter substitute and a sprinkle of Splenda and cinnamon. 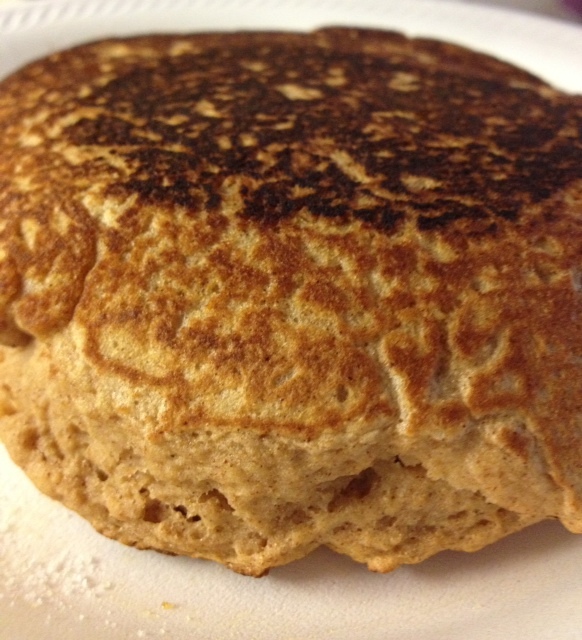 These pancakes were the result of not having food, so I found a recipe for pancakes made with white whole wheat flour, then substituted the Greek yogurt (which I was out of) for a banana left in the pantry. I love these pancakes! I never incorporate refined flour or sugar, butter, oil or margarine or egg yolks into the food I feed myself, so my experiments usually don’t come out fluffy but taste like a hardened version of the whole wheat flour I had used. 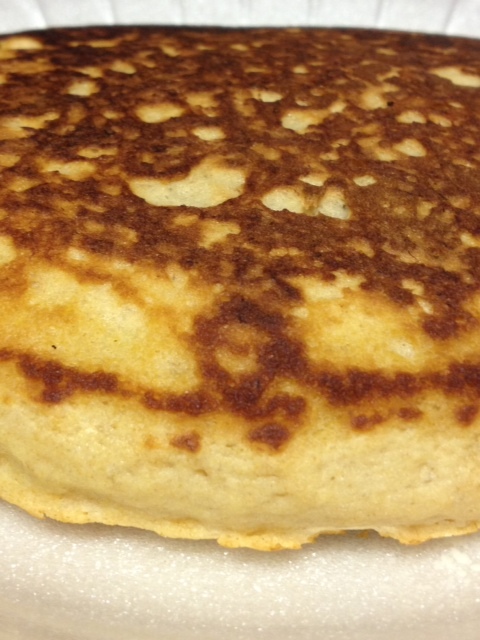 I was pleasantly surprised with my pancakes – made from scratch, made from scraps. Mash the banana into a puree and add to dry ingredients. Add the egg whites and start pouring water until the mixture makes a thick pancake batter (you’ll need 1/4 water or so). I’ve been in a relationship with a gamer for over seven years. Now, I intend to marry him. I am not a gamer. It’s not because I tried and had a dislike for video games, but that I never tried to understand why he does. Now, I feel I have been left in the dark for too long. My gaming days started with Nintendo (Super Mario Bros.) and ended with Nintendo 64 (also Mario). I was hopelessly addicted as a kid, begging Mom (a.k.a. Luigi) to play with me. Luigi always found the most improbable ways to die when Mom and I played. When I think of video games, I have good memories of being a plumber fighting for a princess. The most violent scenes involving squishing evil mushrooms. I have viciously stabbed many a mushroom since. True story. Fiance doesn’t expect me to take up playing his favorite games any more than I expect him to start reading my favorite novels by Dickens. But, I feel I should know more about Fiance’s favorite hobby. I tend to tune out when I wander in and he is playing video games and he starts describing them to me. I hear, “Blah, blah, *pow pow pow* blah, blah, new game coming out, *pow pow* watch this, wait, wait, watch wait, blah, blah, blah *pow*” when he is really saying…uh…well, I don’t know what he is was telling me because I wasn’t paying attention. So, I want to take this opportunity to interview Fiance. Learn more about the art that has him and many other fiancés, boyfriends and husbands hooked. Can I understand the appeal? Me: What was the first video game that you played and how old were you? Fiance: The first video game I played was Pong on the Atari and it had to have been about…about…ss…seven…six….six or seven. Me: What did you find appealing as a child? Fiance: Video games? What are you asking me? Me: Do you find that playing video games since you were six or seven has impacted your ability to follow a conversation? Me: Okay, let’s move on. What video games do you play today? Fiance: Yes, mostly Battlefield 3. Me: How many games do you own that involve you shooting things. In the first person or otherwise, I mean. Fiance: Most of them. Does that make me a violent guy…nope. Me: Wouldn’t you say that you are a violent gamer? Fiance: Gamer? Yes. No, actually the games I play…you are the good guy. So, it is more protecting people…except for Battlefield 3. People who don’t game won’t understand this. Me: Why do you say that? Fiance: Because people who don’t play video games blame video games for killing sprees. It’s the crazy people that go [on killing sprees]. Me: How you would describe an average gamer like yourself? Fiance: *Pause* What are you putting? Fiance: I’m just a normal person who enjoys games. Fiance: Uhhmm. It also…it…gets us away from reality. It puts us in a virtual setting so we can do what we want and be who we want…depending on the game. Me: What is so awful about your real life that you need an escape? Fiance: Nothing wrong with my real life. Me: Dublin threw up, and the stain needs working on. Anyway, back to the interview. Tell me more about your favorite games. Fiance: *Pause* I enjoy Battlefield 3 because it takes strategy. On multiplayer, you have to get a team together and use strategy to defeat the enemy. Me: Do you feel a sense of accomplishment from playing? Fiance: Yes. When the other team is defeated. Me: Some may argue that video games keep you from accomplishing real things…like cleaning up cat hairballs. How would you address this perception? Fiance: For those people who are extremely addicted to games…yes. As for me, I’m not an addicted gamer. Me: What do you think is a qualifier for game addiction? Hours played or otherwise. Fiance: Spending eight to twelve hours playing…everyday. I’ve spent eight hours playing a game once. Fiance: Grand Theft Auto 4. Me: Why play Grand Theft Auto if you are not helping others? Fiance: It’s an open world map. You have the chance of doing whatever you want however you want to do it. You can be the good guy or you can be the bad guy. The campaign, or main storyline, of the game is to be the bad guy. Me: A lot of the first shooter games look and sound the same. What makes them different? Fiance: The game play. Maps…structures…vehicles. All that changes your strategy. Me: Do you feel video games are a hobby? Me: Do think gaming is a hobby that can improve the player? Fiance: With everything, time makes…the more you play the better you are. Fiance: At whatever game you play. Me: So video games are played for the sake of being played? Me: Do you think that they improve hand-eye coordination or cognitive ability? Fiance: Yes, studies have shown that it does improve hand-eye coordination. Fiance: *Explicative* I just read this. I told you about it, too. Remember? Fiance: It was a college, I want to say in Boston. It was on Twitter. They did a big study. Fiance: I will find that Tweet! Me: I stopped caring. So, you play on XBox 360. Do you also play games on your phone? Me: What kind of games? Fiance: Variety. Word games, memory boosting games and old-fashioned arcade games. Me: Why do you play them? Is it to pass the time? Challenge yourself? Challenge yourself to pass the time? Me: Is that why you play games in general? Fiance: *Pause* Yeah, and to relieve stress. Me: If you didn’t have gaming to relieve stress, what do you think you would do instead? Fiance: Work on cars or carpentry. Me: Stereotypically manly hobbies. Wouldn’t you say? Fiance: Yes, I would say so, but not uncommon for women to work on cars or carpentry. Me: Yes, but you didn’t say quilting or cupcake decoration either. Me: So do you find video games more of a male hobby? Fiance: Generally it is more men, but I know females who play as well. Me: Tell me something that you accomplished during your last session of video game playing. Fiance: I got an achievement for transport. Me: I have no idea what that means. Me: Hold on…I don’t care. Wait, okay…I’ll listen. Please continue. Fiance: Unlocks points that mean absolutely nothing other than bragging rights among other gamers. Me: Okay, I have failed to truly pay attention. Why do you play video games? Me: This hurts my feelings. Me: Because I live in your reality. Fiance: Not when you’re asleep. I only play video games when you are asleep. I give you all my time when you are awake. Me: First of all, that sounds creepy. Like the video games are a cover for something much more sinister. Second, you are on your phone right now. Fiance: I’m trying to find the Tweet about the study! Me: No doubt your hand-eye coordination is better than mine. Can you pat your head and rub your tummy at the same time? Me: Damn you. So, your ability to pat your head and rub your tummy is owed to video games? Me: Wait. You went outside?!?!? Me: What would you do if your XBox and phone disappeared? Me: Wait. So you are telling me, that if your XBox and phone were gone, the car would be tuned and the carpet possibly cleaned? Fiance: Probably not…but a better chance? You’re making me sound like an addicted gamer! Me: You are answering the questions! Fiance: But they make me sound like I play 24/7! Me: My questions are unbiased, and I take offense to that accusation! Now, next question. Do you ever find yourself drooling and shaking if you cannot play a video game? Me: Did you play Super Mario Bros.? Me: Did you ever save Princess Peach? Fiance: Not on the NES, I did on the 64. Me. Damn you. Okay, so if I was kidnapped by a giant lizard and held captive, I would have a pretty good chance of rescue? Fiance: Depends on how big the lizard is. Me: I really don’t see the benefit of video games. I mean, I can’t even get a rescue from a lizard here. Fiance: If a lizard was big enough to take you…then it is not real life. Me: I’m relieved you know the difference. Fiance: You’re making me sound not smart. Me: Stop looking at my computer! You said that! Back to my open-ended question…go ahead and say why video games are the backbone of society…and quote sources. Fiance: It’s not the backbone of society. It’s an entertainment industry. Me: I still don’t see why you play. Maybe we need to play something like Super Mario Bros. Fiance: We need to find an NES first. When I was diagnosed with epilepsy at 14, I was devastated and scared. I kept telling myself that I would only have to deal with this until they found a cure. Then my short time with epilepsy will have been like a dream, like it never happened. Fourteen years later, half of my life thus far has been lived with epilepsy. The medication that keeps my seizures under control is a kind of temporary cure, but not the all encompassing end cure we all think of when the word is first spoken. Cure to me means nothing less than it’s gone. No traces left behind. There are cases of kids and teens diagnosed with epilepsy that grow out of it. They become seizure-free adults, no need for medication. I have accepted that I will not grow out of it, something that even my parents and fiancé have a hard time accepting. I won’t grow out of epilepsy, but have I grown out of “cure”? The more I learn about my own illness, the more I realize how little we know about the human brain, and how far there is left to go before disorders like mine can be cured. I don’t see it in my lifetime, so I suppose that I have grown to the point where I stopped believing in being cured. I bring up this question because of all the people I know living with diabetes, I see the passion and belief in a cure more in the newly diagnosed, the children and the parents (of adults and children). There are exceptions (in fact I can name some friends off the top of my head who have lived with diabetes for years, are adults and believe a cure will be found…and sooner rather than decades down the road). But I have met so many people who just don’t believe it’s going to happen. You know the age old story, “The Boy Who Cried Wolf?” Think of, “The Doctor Who Cried Cure In Five Years.” You start questioning the very existence of Wolf. Instead of dwelling on waiting, people start focusing on living the best life possible – chronic illness or no. The passion to talk about a cure and advocate for one is considered a cause not worth fighting for. Like fighting for something already lost. Acceptance, in all it’s many levels and forms, is so important and empowering to living each day successfully, finding joy, and having a good outlook on the future. As for me, I have accepted that I am going to have epilepsy until God takes me off this earth. Note to researchers and the foundations and governments that fund them: Feel free to prove me wrong. I have a good support system. I’m not going to clasp my hands in front of my chest and be gleeful about it. My epilepsy has a rule book that keeps me from doing a lot of normal things.. The worst is paranoia. Every day there is a certain level. It stops me in my tracks at times. Dizzy spell, headache from nowhere, forgetting what I was saying. But my epilepsy could be a lot worse, and it could have taken a lot more from me. I am okay with my epilepsy (as I write this post…today). I am okay with not having a cure. Now, would I be okay if I was holding my child in my arms, watching her lips turn blue? I’m going to go ahead and speak for future me with a resounding no. That would not be okay with me. I would read the research updates, find hope in progress, and hold myself and the world accountable for finding one. People living with epilepsy that suffer from seizures daily is not okay with me. Those “bad days” and scary moments that threaten to take my friends and family living with diabetes are not okay with me. So as much as we might grow out of believing in a cure, many of us will grow up to believe in one. Pine needles, pine needles, everywhere! Why do they take them away from me? Do they hate the fun of the hunt they see? My sense of success and propriety? The captured loss of my enemy – the tree. Keeping me inside is vile, corrupt! And only because…I throw them up. To Sleep, Perchance to…Feel Better? Man, I feel awful. Some days are bad, some days are worse. Headaches and stomachaches against the backdrop of fatigue. My sluggishness began about five months ago and has become progressively worse. Medication doesn’t help and caffeine only helps in the morning. After listing everything I could possibly think of, my doctor pinpointed sleep – or rather, my lack of good sleep. We all know that to be healthy, you need to get sleep. But lack of sleep also impairs the body’s ability to digest food. Melatonin is associated with our sleep cycle, but it also works to regulate digestion. Sleep deprivation means that the hormones melatonin and prolactin, produced in the middle of the night, are not able to do their job of enhancing immunity. Immunity clears up toxins in the gastrointestinal tract. Ironically, my stomach pains wake me up in the middle of the night. At least three times during a night. What started my sleep problems? Stress. I may not feel stress in the conventional sense, but circumstance has added a whole new plate issues to learn to deal with, whether I feel stressed about it or not today. Stress hormones lead to insomnia and sleep disturbances. My attempt to regain sleep by focusing on and dealing with the emotions associated with my stressors – apparently causes more stress. A study out of Tel Aviv University found that subjects who focused on their emotions and anxiety shortened their sleep cycles. Ironically, lack of sleep, stress, and stressing about lack of sleep, have also caused vivid nightmares and sometimes night terrors, which also wake me up a few times during the night. What wards off nightmares? Getting good sleep. When the morning finally arrives, I am exhausted and dealing with fresh headaches. Months of exhaustion and just feeling sick can cause depression. Guess what? Depression causes sleep issues and digestive problems. So, I am trapped in a vicious circle of cause and effect. I am sick and tired of feeling sick and tired. It will take time, and a lot of work for my body to return to a healthy balance. But being healthy, and more importantly, being myself, is worth the work. Grandma always used to tell me was all she wanted for me was that I be happy. Let the New Year’s Day resolutions commence. Already on all my social networking sites I have seen healthy recipes, exercise tips and lifestyle plans being tweeted, posted, emailed and pinned. Among my past resolutions, I have resolved to lose weight, cut down on coffee, learn Spanish and take dance classes. My favorite year was the one where I resolved to develop more muscle tone. Ahh…good times in smaller pants. Well, since losing the extra weight is now a weekly resolution, I am not setting myself up with that one. Getting healthy is also a daily resolution, a constant balancing act of medication, meditation, exercise and most importantly…SLEEP. Sorry, but Spanish and dancing will take a backburner again this year. I know myself slightly better. When I can, I will. This year, I just want to focus on being happy in the moment. Not a new resolution, but one that should be revived. So much stress and fear this past year has broken my body. Yet, I am still here. One thing I have learned is that our good days can become a memory all too soon, within the blink of an eye. Money can dry up, disease can invade and the sense of security can dissipate. I do not have all the things I want, and I have not accomplished what I wanted to accomplish, but I have today. I can make the most of it, and appreciate the heartbeat of my fiancé under my cheek and the purr of my cat under my hand. Tomorrow is a new day, but today is pretty sweet within itself. My 27th year was filled with great change and new challenges. I changed jobs twice, moved twice and got a puppy. Oh wait, that last one is slated for this next year, along with moving out (again) of a one bedroom apartment. I took every opportunity that God presented to me and took great risk. I mark my birthday in the midst of getting on my feet and feeling secure. This past year has brought adventure. That would be an understatement, actually. With the love of my life, I have put my wings to flight and found so much “new.” New is exciting, adds to experience, but also adds challenges. I know myself to be a tough cookie. I have a strength to take on challenges that present themselves to me, with the repetition of “This too shall pass” in my head. What I was not prepared for was that this past year presented unprecedented challenges to my family and the people I love. New and recurring health battles for my family and myself, along with the stress of finding stability in the “new” has left me emotionally and physically drained. I needed to take today to stop the whirlwind of worry around my head and try to find meaning in it. When my mother was 28 years old, she married the love of her life, my father. In the next year, I plan to marry the love of my life, and build a foundation with him. I am so grateful for Fiance. This past year has taught me that you can lose important pieces of your life in an instant. Relationships can change, money can disappear. I have learned that I must cling to the important people. My family, my friends and Fiance, my partner in everything. Even Dublin. I’m not going to fret that a wild bird of prey will swoop down upon our tiny balcony (at the exact time that I let Dublin outside to hunt for pine needles) and grabs him with his giant claws and whisks him away to be devoured. No, I will just hug Dubbers every day and not dwell on his feline fragility. The same applies with everyone and everything. I will appreciate what I have while I have it. Each moment and each day of my 28th year. I’m not going Christmas shopping this year. Sorry, friends and family that usually get stuff from me! I didn’t really reach a spiritual realization. I always knew the reason for the season and whatnot. But along with celebrating the birth of my beloved Savior Jesus Christ for which I owe my entire life and salvation, I also enjoyed getting jam jams from Target and buying new sockies for Mom. 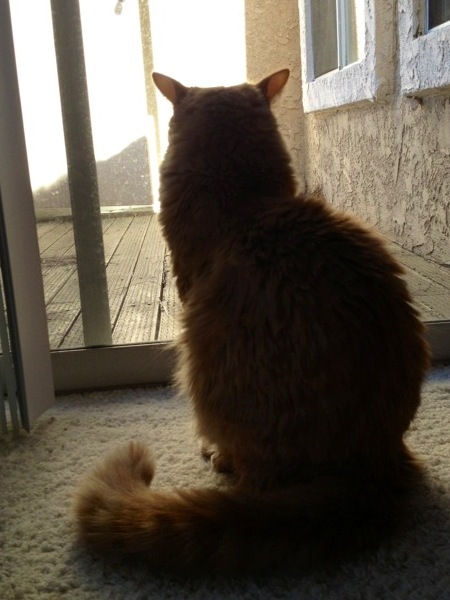 I miss shopping for friends and family and the furkids. I missed Black Friday shopping for me and Fiance. Reasons for the shopping abstinence? Well, the rent is too damn high! Seriously, the life-changing move Fiance and I made to California included tons of moving expenses coupled with a higher cost of living. While we are getting on our feet and becoming Californians, we cannot partake in the material aspects of the season. So, while we are being responsible adults with our finances, we are forced to really appreciate what Christmas is about. Cookies. We can fill the void of new things and buying Mr. Coffee Cocomotion machines for our loved ones (whose lives have yet to be changed by this device) by stuffing their faces with fattening cookies. And cake. Ingredients can be cheap, just add time and butter. Also, this forces us to think about our blessings. I will be with family in December. I have my Fiance with me to hug me and dream about next year with. The furkid cares not for new things, but only the box it came in. Pinterest product boards and Etsy will be there next year, but these moments together are fleeting and must be appreciated for what they are – time together while it is gifted to us. Today marks another World Diabetes Day. November 14th commerates the birth of Sir Frederick Grant Banting, one of the men who discovered insulin, saving millions of lives. November is Diabetes Awareness Month, in which the diabetes community goes blue, or gray, or blue and gray. The hope is that our neighbors to which diabetes is foreign will learn something about a disease that impacts hundreds of millions worldwide, each one differently. Just keeping up with what is new to learn in diabetes is a full-time job. (I almost kind of sort of have that job.) Each person living with diabetes has a unique perspective, a perspective that must be respected, because only one person knows what diabetes is. It’s their enemy, it’s their greatest motivator, it’s their burden or its their success. Learning about what diabetes means to different people living with it or caring for someone living with it, has became an ever increasing focus of creating awareness. This month is also Epilepsy Awareness Month. I know remarkably little about my own illness compared to the information I have accumulated on diabetes. In fact, I know few others with epilepsy, enough to count on one hand. I have more friends with diabetes than I do without. I know my epilepsy as best I can from tests and discussions with specialists. I know my epilepsy from how it impacts my daily life, how it impacts people’s opinions of me, and I am quite aware that it could be worse. This month also marks new types of awareness for me. I am now more aware of Parkinson’s. My father was recently diagnosed with a disease I knew absolutely nothing about. Search by search, I am learning more, becoming more aware, learning about our next steps. I was also woefully in the dark about cancer, until my sister’s recent diagnosis sent me searching for information. Information filled with very long words for complicated categorizations, treatments and stages. At this point, I’m becoming tired of becoming disease aware. It’s a lot of awareness to take in. Through the health obstacles I know, all the new ones to learn about, I found a deeper awareness. I am more acutely aware than ever how fragile our bodies are, how susceptible to disease they can be, and how important the strength of the spirit is in attaining health. I am more aware that my family is more important than the next paycheck to pay the bills. I am more aware that the tight embrace of a new friend can lift an enormous weight of anxiety off the shoulders. I am aware, through continuous reminders, that God is good, that he is all around us and that something will be learned of new challenges to the body. Another new awareness to come…to make us stronger and able to lift up others not yet diagnosed..or even aware.